Lesson Plan: Pets! / ¡Las mascotas! 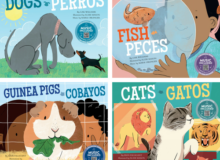 Students will get to know the essentials about each popular pet and its basic care while also embracing enthusiasm for a new language. This interactive lesson plan offers classrooms the opportunity to explore this perennial topic with a bilingual approach. Activities include math, art, report writing, and more. Get STEAMing: math, art, language, and experience extension activities are also included! Download or stream the Pets! / ¡Las mascotas! songs for free! Below is an example plan, in both languages, for teaching a single title from the series.